Specifiers and contractors beating a path to Gartner Superlux’s door to discover the hundreds of new products in the latest Superlux lighting catalogue will find that pathway well lit following the release of a new range of Recessed Deflector Lights. Designed for both indoor hallways and outdoor paths and access ways, the versatile IP 65 cast aluminium LED deflector lights can be mounted in almost any type of wall thanks to the alternate clip systems designed by Superlux. This installation versatility highlights the decades of experience Gartner Superlux brings to luminaire design for New Zealand applications and shows why Superlux fittings are finding greater favour with specifiers and lighting designers, as much as they are with contractors for their ease of installation. Electrical contractors and their suppliers are now bearing the brunt of an Australia-wide recall of non-compliant cable following the decision by regulators to require the potentially unsafe cable to be made safe or be removed from the premises it has been installed in. A taskforce of 21 federal and state consumer agencies, building regulators and electrical safety regulators are coordinating a series of safety recalls as a growing number of hardware retailers and electrical wholesalers are identified as having sold the cable and are now having to implement recall arrangements. Expected by the taskforce to cost at least $80 million, the decision to recall installed cable has taken 16 months since the first state electrical regulator, Energy Safe Victoria, was advised that Infinity branded TPS and orange round cable imported by Infinity Cable Co Pty Ltd failed testing for compliance with the cable standard AS/NZS 5000. Trade sector organisations have welcomed the news that the Government will draft legislation to impose a fiduciary duty on property developers and contractors to protect subcontractor retention payments from secured creditors in the event of a construction company collapse. Building and Housing Minister Nick Smith announced the Government’s intention to introduce changes a week out from the September general election, detailing a policy blueprint that could have broader implications for the construction sector. The notion of disconnecting from the national grid and becoming energy self-sufficient through the use of solar panels and batteries has long been discredited as economic lunacy but the dynamic is changing and it is changing rapidly. Globally, solar industry leaders and pioneers in the solar space are projecting a paradigm shift away from grid-connected solar installations to standalone or hybrid solar solutions combining battery storage and on-grid connectivity. The solar industry’s foundations were built on the back of energy storage – the pairing of solar panels to lead-acid batteries – and that is how it was for 30 years until electricity regulators (including our own) relaxed their grip on the national grid and created pathways for residential solar installations to feed power back into it. This was a game changer and it turned the solar industry on its head. If the AC motor is the lifeblood of industry then the variable speed drive (VSD) is the artery through which that lifeblood flows, controlling every aspect of motor performance to increase efficiency, lift productivity, deliver safety and protect against premature mechanical failure. 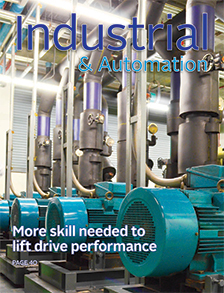 Often referred to as the electrical interface into the mechanical world, variable speed drive design has evolved over three decades to become a cornerstone of industrial automation and integrated machine safety. In its simplest form, the variable speed drive is now a commodity item, providing industrial end-users with simple plug-and-play drive solutions that require minimal user input to achieve basic motor control functionality across core operating parameters – speed, torque and start-up. 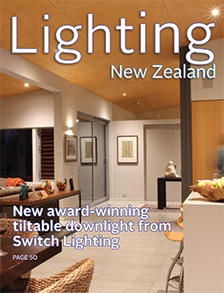 A new tiltable downlight for sloping ceilings or lighting decorative wall features has extended the premium downlight range designed by Kiwi LED manufacturer, Switch Lighting, bringing more versatility to the residential lighting options available to homeowners. 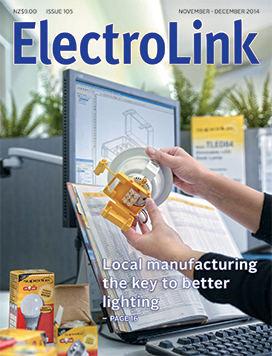 “Now designers and electricians can light an entire home using our D-Lightz and E-Lightz ranges, supplemented by luminaires from our Lumoluce range imported from Europe,” says Switch Lighting managing director Gerard Woods. He says the new D-Lightz Tilt is the ideal light for recessing in sloping ceilings, highlighting artwork and for general lighting applications. The New Zealand chapter of the Illuminating Engineering Society (IES) announced the winners of its 2014 Lighting Design and Luminaire Design Awards at an awards presentation held at the Auckland City Art Gallery on November 7. This year’s awards attracted 23 entries across three categories – Luminaire Design, Lighting Design, and Energy Efficiency. A fourth Dark Sky Award was presented by the Royal Astronomical Society of New Zealand. The Government’s energy efficiency watchdog is preparing for a fresh round of minimum energy performance standards (MEPS) in the lighting sector that could effectively spell the end of the common GLS incandescent lamp. But the 100-year-old GLS lamp is not the sole focus for minimum energy performance reforms. The Energy Efficiency and Conservation Authority (EECA) has confirmed that it is also targeting MEPS across most other common lamp types including the most energy efficient of them all – LED. The authority is preparing to release a series of three lighting ‘product profiles’ between now and the middle of next year as the first step on the pathway to introducing MEPS across incandescent and halogen lamps, LEDs and compact and linear fluorescent lamps.